One of my greatest loves is a good ol’ meta-fiction novel. Meta-fiction refers to fictional works that draw attention to the fact that they are a work of fiction. I’ve begun a list of female meta-fiction authors here, as mentors for my own writing. 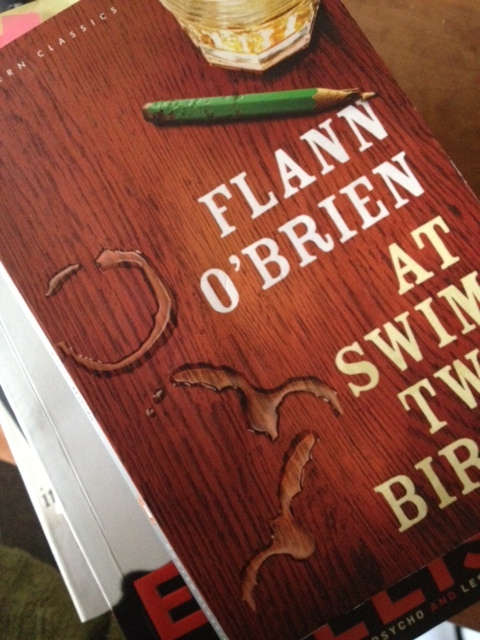 My favourite meta-fictional work, At-Swim-Two-Birds, is a meta-fiction-feast – a story within a story within a story within a story within a story. And my favourite section of AS-T-B has the characters of one story give the writer a good beating. It’s not so much the thrashing I love, but that the characters take revenge on the author. It’s a scenario that I’d love to include in my own novel one day. And I couldn’t help myself, I’ve written my own little meta-fictional work, but it doesn’t have an author beating. At present it’s doing the rounds of agents, so wish it luck will you? The main character, a homeless man, (male mental health is a theme that runs through all my books to date) befriends a woman who is a struggling author. She steals his life story to use as a novel, and as the story unfolds, it becomes apparent this story is the novel itself. Over the years I’ve read a few meta-fictional works that I’ll list elsewhere on this blog. I’m gradually adding the notes that I made at the time of reading, not reviews of the books, but simple notes that I made with no intention of blogging – at the time there was no such thing as blogging, let alone an internet. A related genre is the self-reflexive novel: a fictional work in which the author refers to themselves in the work, and/or refers to the work itself. Of course, a novel can be one or all of the above, makes definitions complicated, doesn’t it.